500 Women Scientists has over 100 pods around the world, thanks in large part to Dr. Angie Pendergrass, our amazing Pod Coordinator and member of the leadership team. This week, get to know Angie on #meetascientist. She shares her passions for science and coalition building, as well as her love of adventure and the environment. When did you first identify as a scientist? Tell us about your work and any outreach efforts you are part of. I first identified as a scientist sometime between age 9 and 18. I was pretty active in extracurricular academic competitions. In high school, I won the state physics test once. At that point I think I already identified as a scientist. My parents were a big influence — they're both scientists. Now I study precipitation and how it changes with climate. 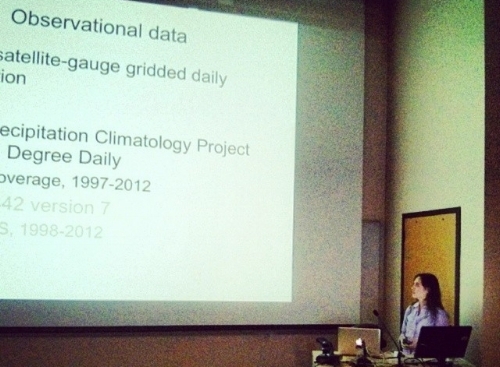 I use observations (which mostly come from satellites) and also climate models. I like building theories where I can do math on paper. One part of my PhD dissertation was building a statistical description of how the distribution of rain changes - how it can get more or less heavier, and more or less frequent - that I applied to El Nino events and to climate model simulations of global warming. That was really fun, and I'm still picking up threads from it and expanding on them. An awesome outreach effort that I'm involved with is OAR Northwest. They're a group of open-ocean rowers who go to classrooms (sometimes via Skype) to teach kids about leadership, adventure, the environment, and science. I got involved with them when they were preparing for a trip across the Atlantic ocean and needed a weather forecaster. With a team of grad students in atmospheric science, we made forecasts for them (also for their followers) for their training trip around Vancouver Island and also their trip across the Atlantic. And later, when they rowed the Mississippi, I got to spend a week rowing with them! OAR Northwest is made up of awesome and inspiring people that I feel super lucky to be involved with. You are the brains behind the Pod set-up, how have you approached organizing this? What are the big and/or long term goals for pods? What do you hope to see happen? From the get go, my approach to the pods has been to empower all the awesome energy of the pod coordinators and members. Back in January or so, some of the leadership team hatched the idea for pods, and I agreed to take it on. But before we even really decided what to do, some 500WS members starting asking to start local chapters! So I came up with a sign up system as quickly as I could, so they could make their magic happen. And it built from there into a huge and amazing network of pods! I've done some logistics to help the pods scale up quickly, but the pod coordinators and members are definitely the driving force. The initial goal for the pods has just been to get women scientists meeting together in person. 500 Women Scientists started as an internet phenomenon - from people who had known each other in real life, but whose paths through science had scattered them across the world, and then quickly spread to so many more. But there's real power that can only happen when people get together in real life, share their experiences, and consider what impact they can have in the communities where they are. Now that we have tons of pods, many of which are chock full of charged-up ladies, I hope we can start to focus that energy and start taking action, making progress on our (new) mission - transforming science to be diverse, and transforming public engagement with science. Angie in action, defending her Ph.D. thesis. As a scientist in Boulder, CO where there are academic, government, industry, and private sector scientists - what is the benefit of having scientists from so many sectors? Why should we try to be inclusive of all the different types of scientists? Being a scientist is about an outlook on the world more so than the specific job you find yourself in or the problem you're working on at any particular moment. A lot of times we scientists silo ourselves, because we're focusing on a specific problem in your field, or subfield, or subsubfield, for years at a time. We tunnel into a small corner of the world - and we sort of have to do this to make progress on a problem. As a result, it's easy to get cut off from the rest of the world, including other scientists. The Boulder 500 Women Scientists Pod has been really awesome because there are women scientists in all types of jobs - research university, labs, and also industry - and hearing their experiences and seeing what's different and what's similar gives me perspective on what we have in common and what might be specific to our type of job or field. For me personally, having a group of scientists who aren't working at a research lab studying climate these last few months has been really grounding, and has helped me keep (a little) calmer. What it really comes down to is that there is so much to learn from people who share our interests but are in a different place in the world, and it's powerful when we can all get together. For you, why is having a organization focused on empowering women important? Looking back over the last half-century of history, the role that women have been able to play in the workforce has changed dramatically. This isn't a very long time. The kinks are not worked out yet. Society as a whole and also science haven't settled into a pattern that works well for humans, men or women. To make the system better for everyone, we need to transform it. Men have set the system up and they still have a disproportionate share of power and of its benefits, so they have much less incentive to change it than women do. So for change to happen, women's voices need to be heard. We need to get together and amplify women's voices to make that happen. Angie combining her love of yoga with her love of the water. Outside of science, how do you spend your time? I love the water - I swim, sea kayak when I'm near flat water, and hang out by Boulder Creek when I'm not. I also love hiking, reading, and traveling. Angie Pendergrass is a research scientist studying precipitation and how it changes with climate at the National Center for Atmospheric Research in Boulder, Colorado. She got her PhD in atmospheric science from the University of Washington, and her BS in meteorology/math and physics at the University of Miami. She's originally from the Great Lakes, and has visited all 50 states and 5 of the 6 inhabited continents. She is the 500 Women Scientists pod meta-coordinator.